On Monday, 13th March 2017, members and invited guests of the German-British Society Nuremberg gathered at the Prickheimersaal of the Caritas Pirckheimer Haus to listen to a talk by Prof. Dr. Michael Strürmer on the topic "World without world order? – Which role will the UK play?". The society's Annual General Meeting took place as scheduled after the talk..
A large audience listened to a very entertaining talk by the renowned historian. Professor Stürmer painted a very vivid image of the current geopolitical situation, in which the United States of America, Russia, China and Europe are jostling to define their roles, a situation that, in Stürmer's words, means everything but the end of history. In addition to a close look at the UK's future prospects after Brexit, Prof. Stürmer also gave overviews of the Russian situation and the conflict in Ukraine, together with the role of China. 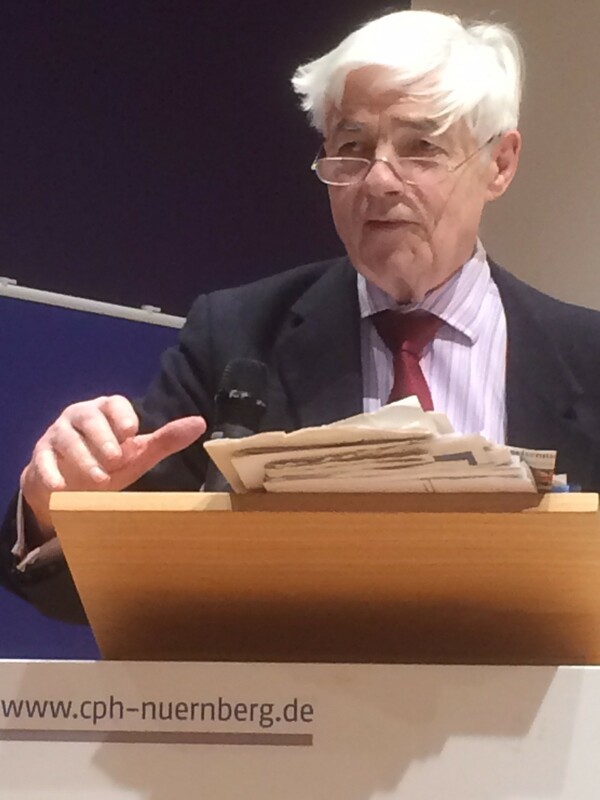 The speaker positioned these current developments very clearly in their historical context and made his talk even more lively by referring to his own personal impressions of the protagonists of world politics, impressions that were gained while working as a foreign affairs advisor to the Kohl government. Prof. Stürmer illustrated the extent of his knowledge by answering questions from the audience in excellent detail and the subseqent break gave people the opportunity to discuss individual topics with the expert while enjoying wine and brezels provided by the society. . The ensuing review reminded people of the many talks that have provided a broad range of attractive contributions – topics ranging from "Pain" to "Shakespeare in the Arts", and very successful parties. For the coming 12 months a similarly attractive program is in planning; there will be a talk about the children's book author and illustrator Beatrix Potter as well as an excursion to the "Britannia in Bamberg" music festival; in addition there will be our traditional meetings for an "Asparagus Dinner", for our Summer Party and the Annual Dinner in November, where we will celebrate the 40th anniversary of the society. During a brief speech to thank the members for his election, Bill spoke about the need for "Togetherness" and how this would be the theme for the Society's activities going forward. 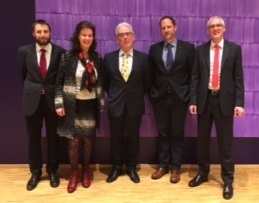 These two elections brought the Annual General Meeting of the German-British Society Nuremberg to a close with a positive perspective into the Society's future.